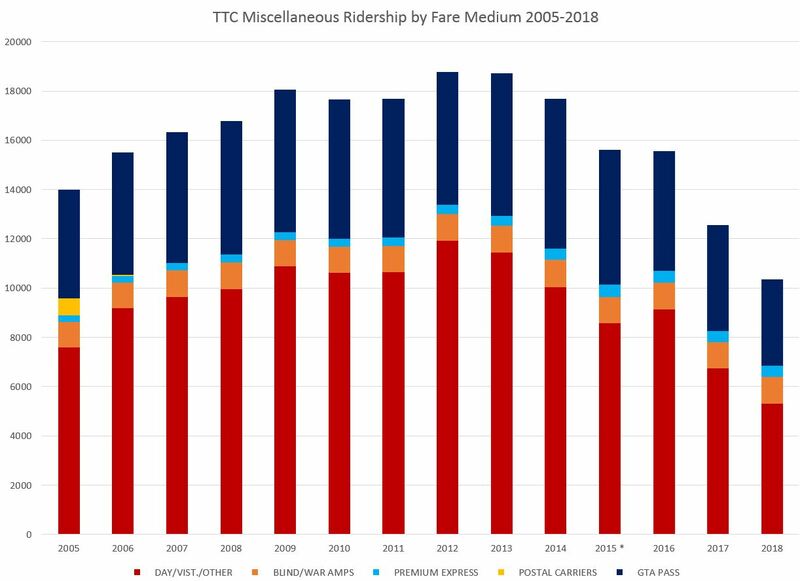 TTC service changes for the schedule period running from the end of March through to mid-May 2019 are comparatively minor. The reconstruction of King-Queen-Roncesvalles, originally planned to start this spring, has been delayed to 2020. Planned changes in affected streetcar services will not occur, although some revisions to 504 King are expected in May to address service reliability. The schedules for 29/929 Dufferin service have been left as originally designed for this period with all service extended to the Princes’ Gate Loop. This change will be reversed in May. Construction begins on the CNR bridge over Coxwell Avenue. Half of the underpass will be closed at a time, and this begins with the northbound roadway. 22/322 Coxwell services will divert via Woodbine and Danforth. Reconstruction of the bus roadway at Jane Station was planned to begin with these schedules, but work has been deferred until May. The new schedules provide for extension of the 26 Dupont and 55 Warren Park routes to Old Mill Station, but they will actually operate to Jane Station pending start of construction. At that time, the 35/935 Jane services will shift to on street loading on Jane Street. 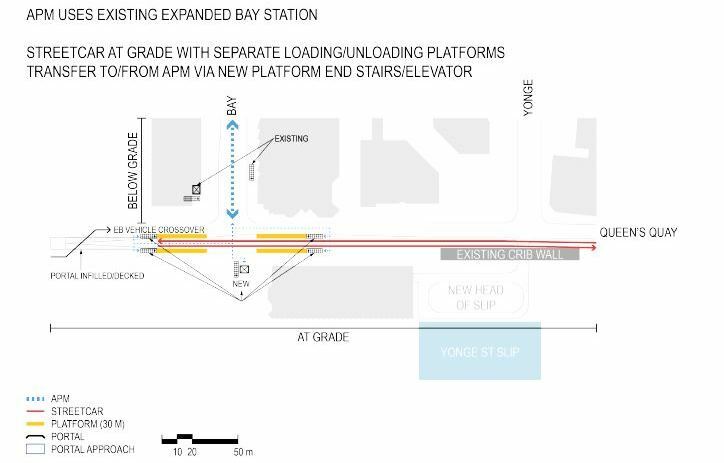 On line 1 Yonge-University-Spadina, the crew relief and break point will move north to Vaughan Metropolitan Centre Station from Sheppard West Station. Route 95/995 York Mills will be revised with weekday midday 995 express service added to the schedule. The midday 95B service to UTSC will be replaced with 95C service to Ellesmere Station as in the peak periods. There are minor changes on several bus routes (see the linked summary for details) to adjust running times and headways. 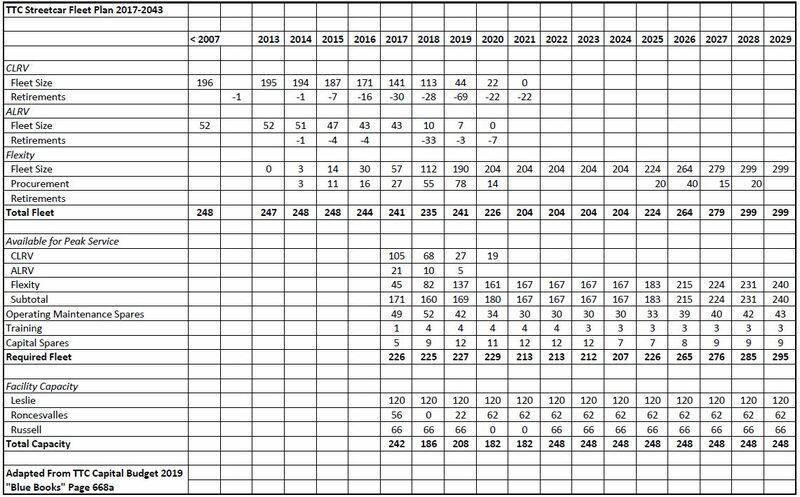 Updated March 14, 2019: The number of vehicles on 167 Pharmacy North has been corrected in the spreadsheet linked below. 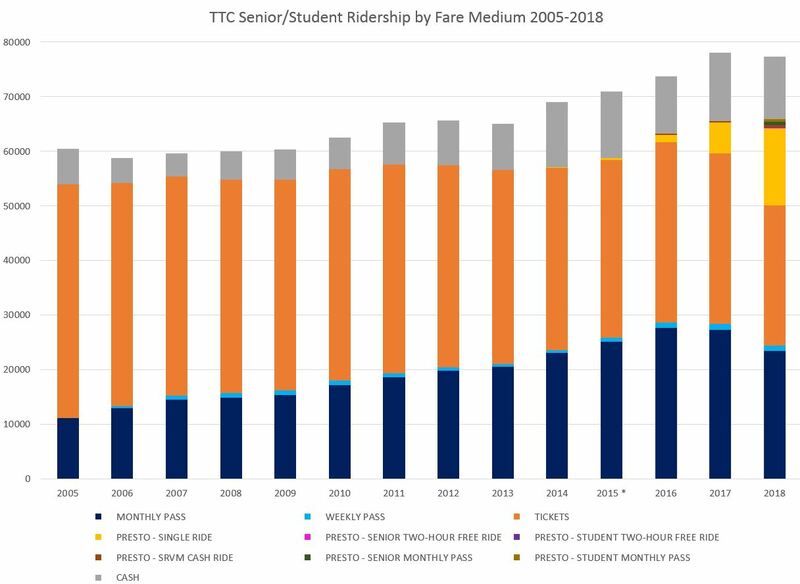 With official ridership stats flat or falling over the past few years, and the annual pressure to raise fares to balance the budget, the issue of fare evasion comes up regularly as an untapped revenue source. 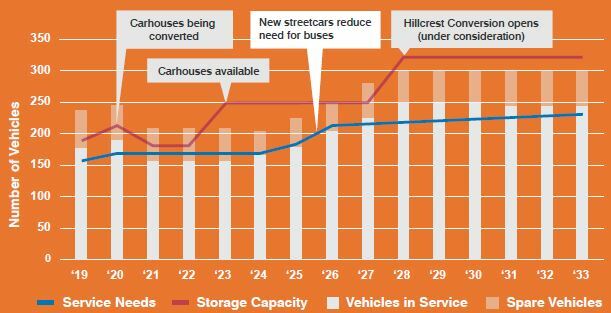 This became a particular concern with the move to all-door loading on, primarily, the streetcar network where the absence of a fare check at vehicle entry gives more scope for evasion than on buses or in subway stations. 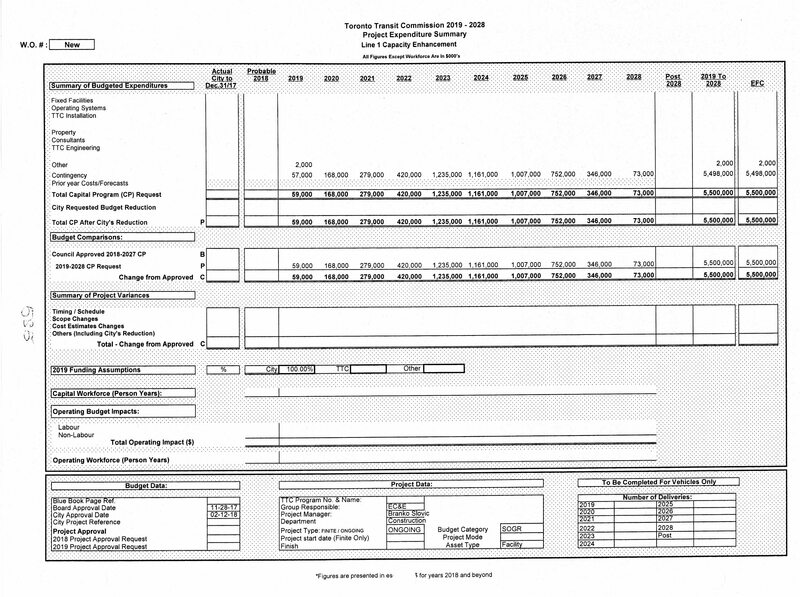 Toronto’s Auditor General (AG) has issued a report and a video on this topic. They will be discussed at the TTC’s Audit & Risk Management Committee meeting on Tuesday, February 26, and at the full Board’s meeting on Wednesday, February 27. 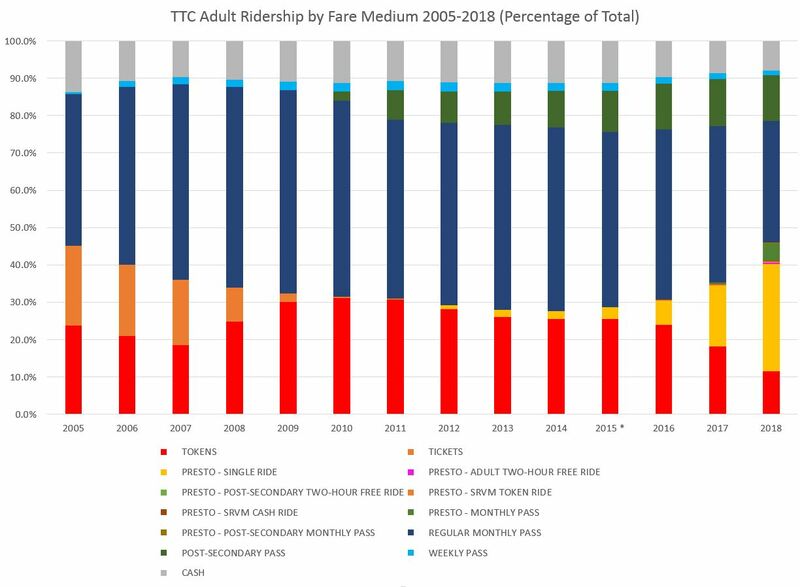 The political context of fare management comes in on a few counts, and should be remembered when reading about dubious decisions and practices as flagged in this report. 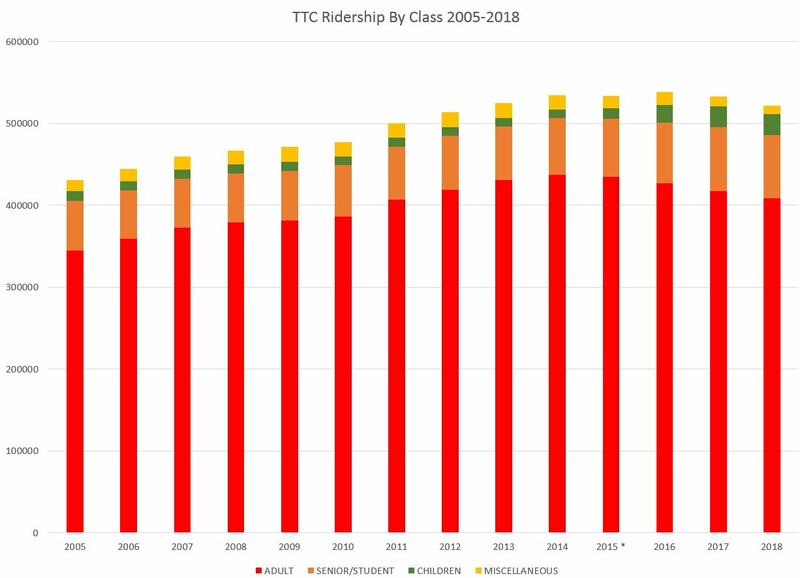 As the TTC shifted to larger vehicles, primarily on the streetcar system, an important goal was to increase the ratio of riders to operators. 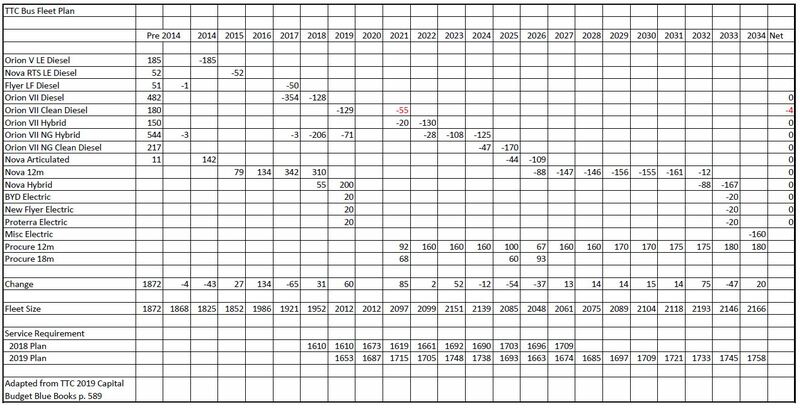 However, as all-door boarding and Proof-of-Payment (PoP) became more common, the need to validate fare payments went up. 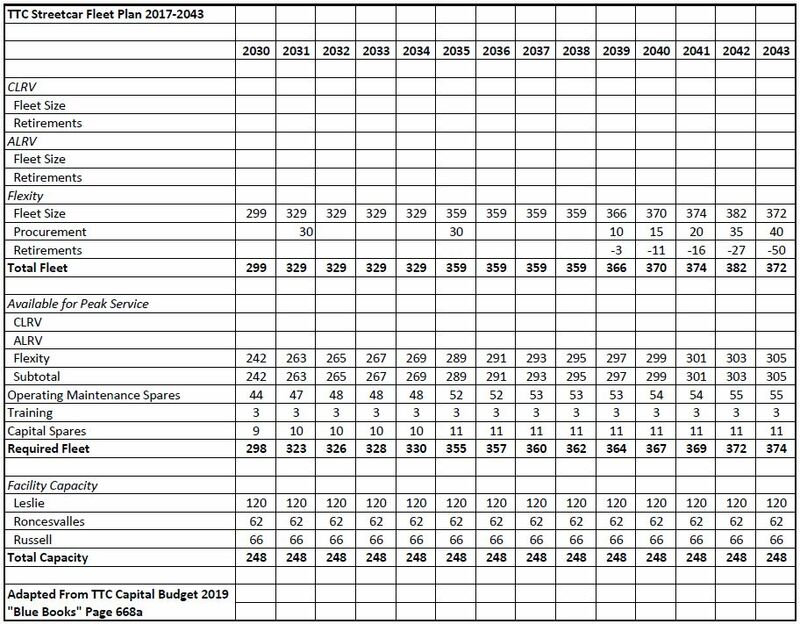 The politicians who control TTC funding at the Board and Council levels have a fetish for “head count” where limiting the growth in staff, or better still reducing their numbers, takes precedence. The result was that the number of Fare Inspectors did not keep pace with the growth in PoP. 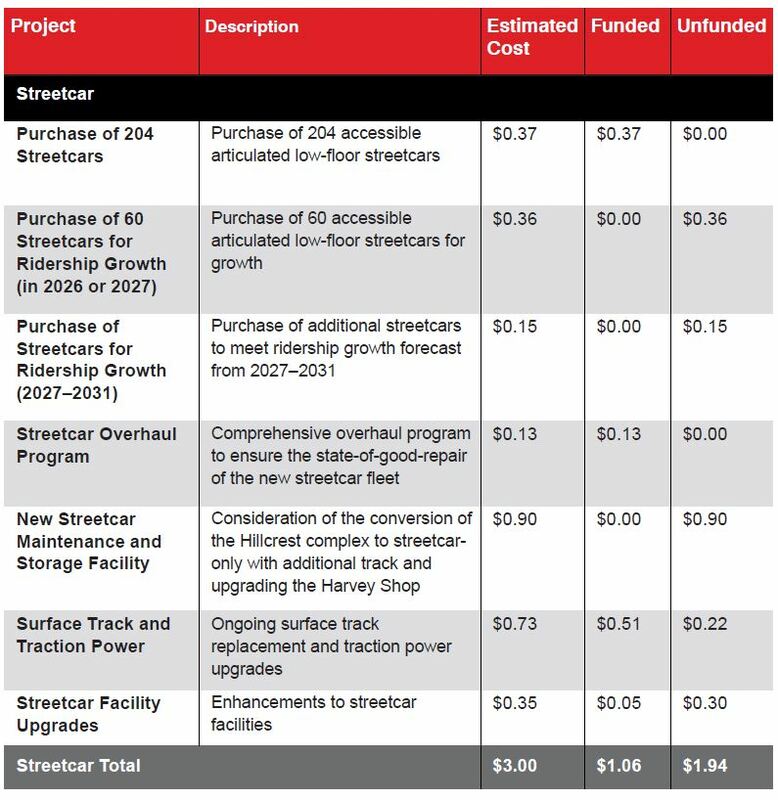 Presto was forced on the TTC by Queen’s Park under threat of losing subsidies for other programs. There is a strong imperative to report only “good news” about Presto both at Metrolinx and at the TTC for fear of embarrassing those responsible at both the political and staff levels for this system. Getting the system implemented took precedence over having a fare system that worked. 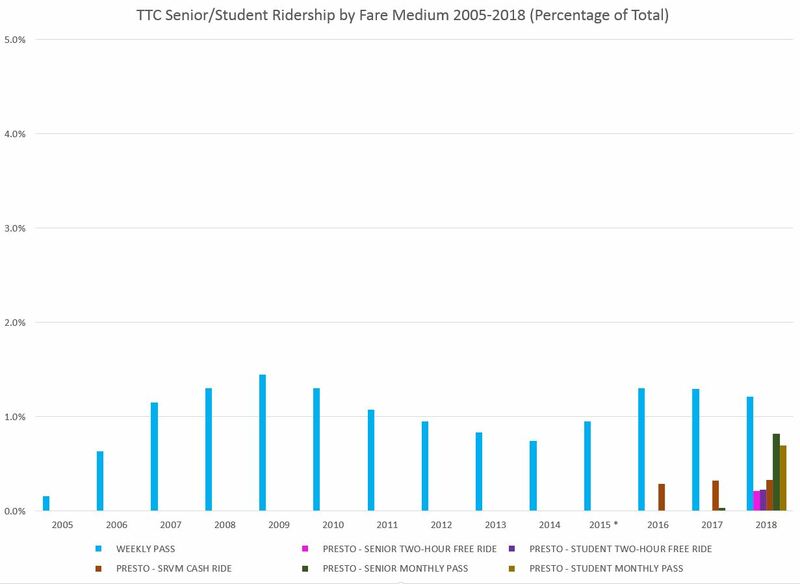 Historically the TTC has claimed that fare evasion on its system amounts to about 2% of trips. 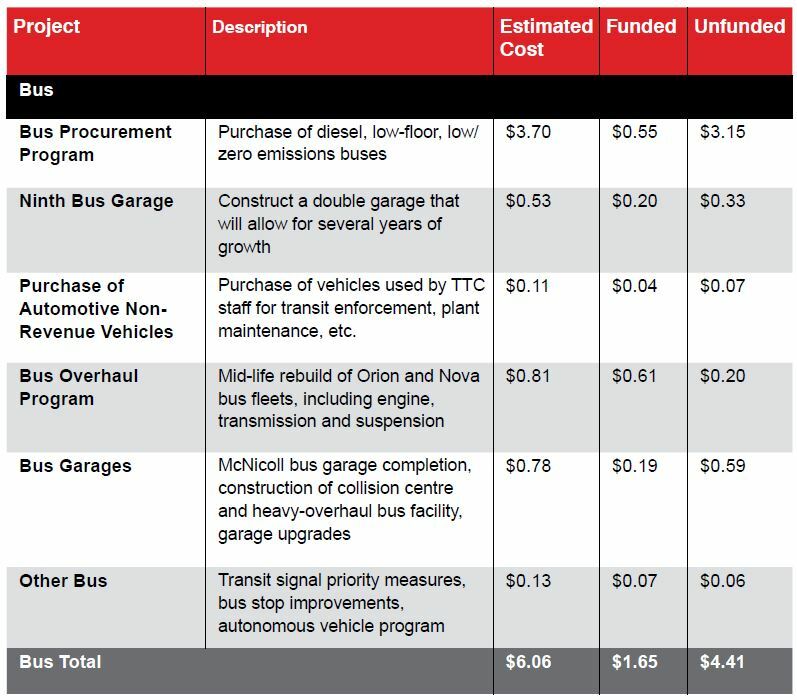 With fare revenue for 2019 budgeted at $1.2 billion, this would represent a loss of about $24 million in revenue. If the actual evasion rate is higher, assumptions built into the PoP and Presto rollouts especially about the scale of enforcement required, are no longer valid. 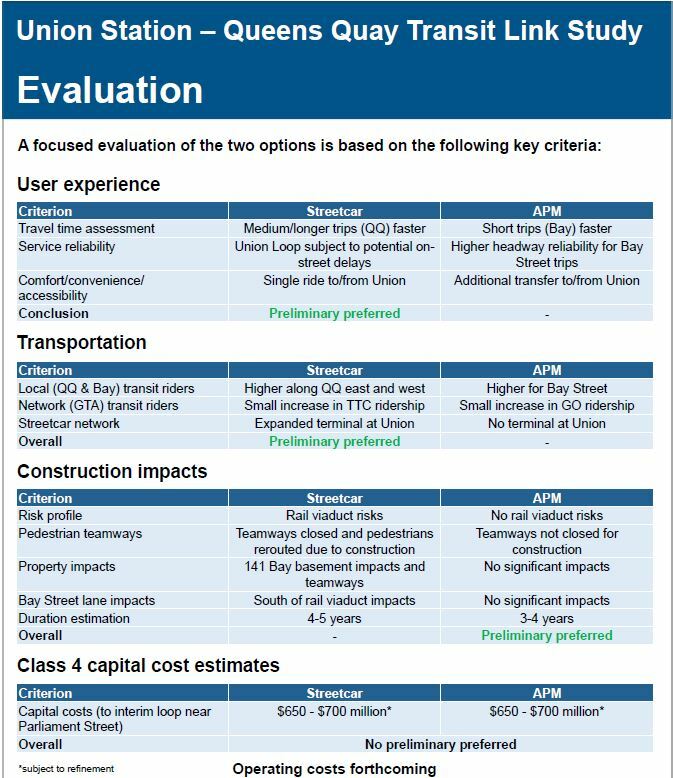 Through all of this, there are many examples of poor co-ordination between Metrolinx/Presto and the TTC, of poorly thought-out implementations of procedure and of operational practices that simply do not achieve the best possible results. There is plenty of “blame” to go around, but a fundamental problem is that the system “must work” for managerial and political credibility. 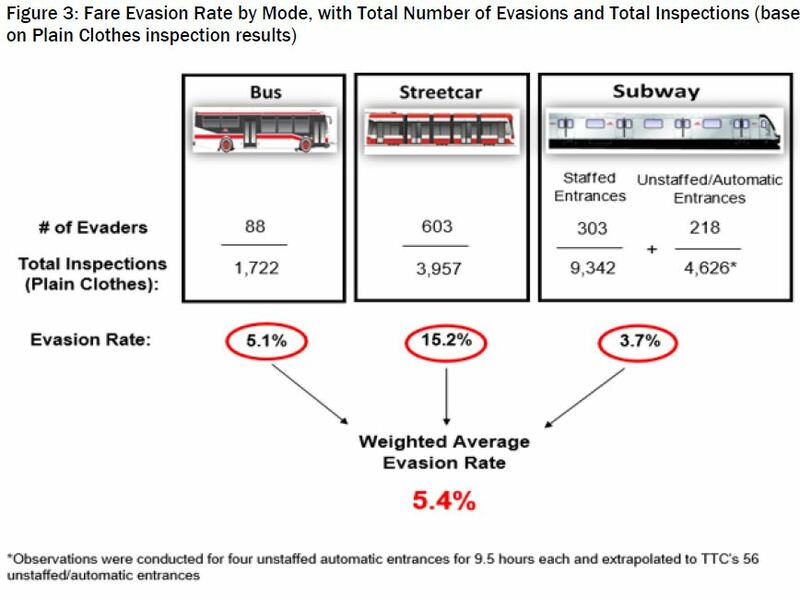 The AG conducted a six-week review of actual conditions on the subway, streetcar and bus networks in November-December 2018 and found that the actual evasion rate was substantially higher, especially on the streetcar system. 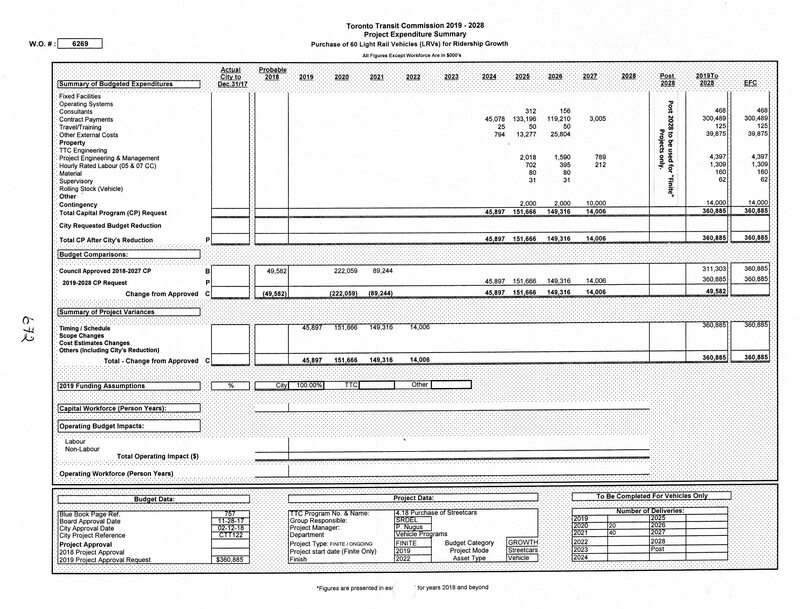 The dollar values shown here are built up from mode-specific evasion rates and the level of ridership on each mode. 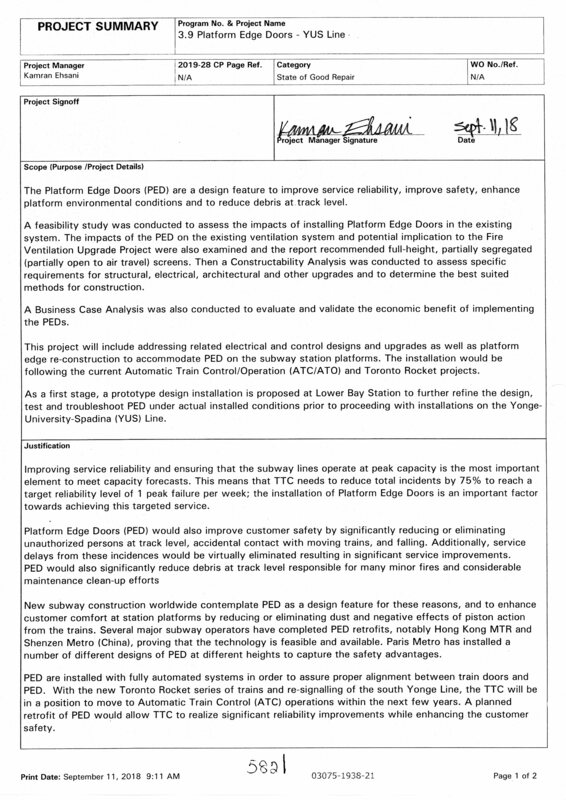 Problems with Presto contributed about 5% to the $64.1 million total in lost revenue, but this does not include issues with fare gates or TTC practices regarding “crash gates” in stations which allow fast entry for riders with media that can be checked visually. 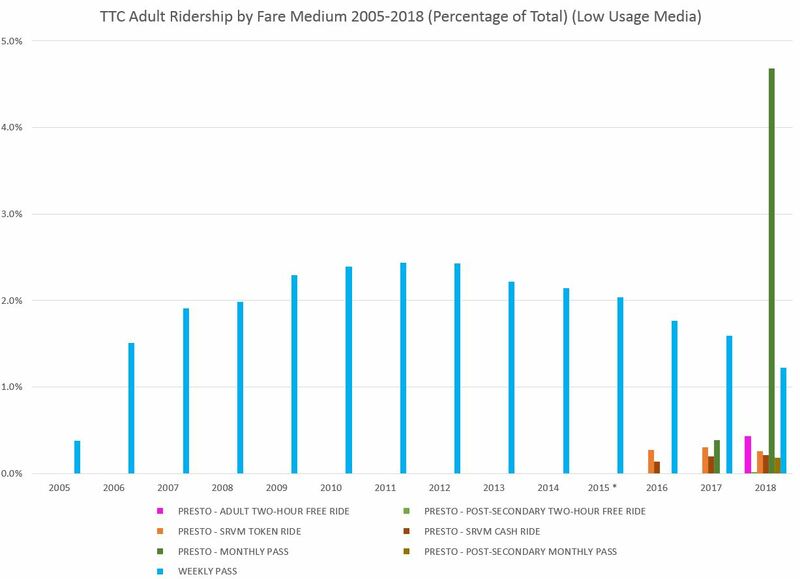 The proportion of such riders has dropped substantially with the end of Metropasses, and will fall again when tokens and tickets are discontinued later in 2019. 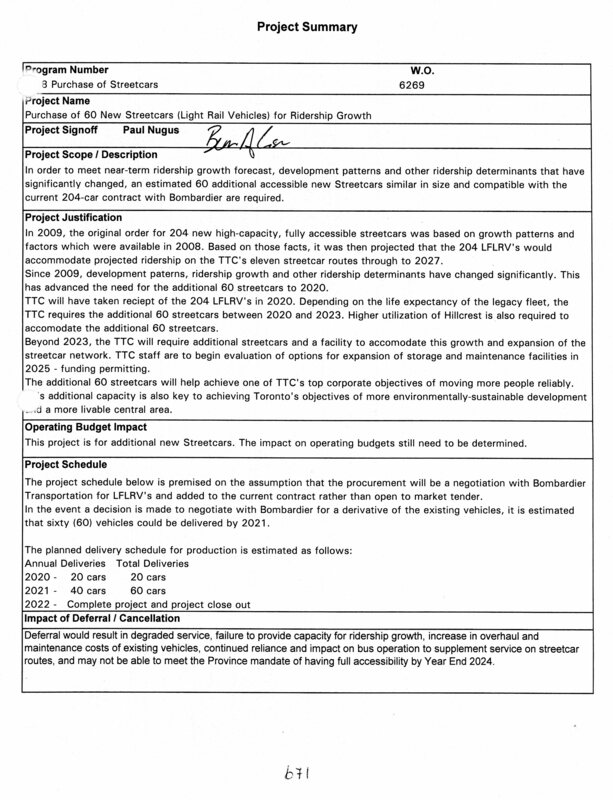 The report contains 27 recommendations all of which have been accepted by TTC management. The challenge will be to see how they are implemented. 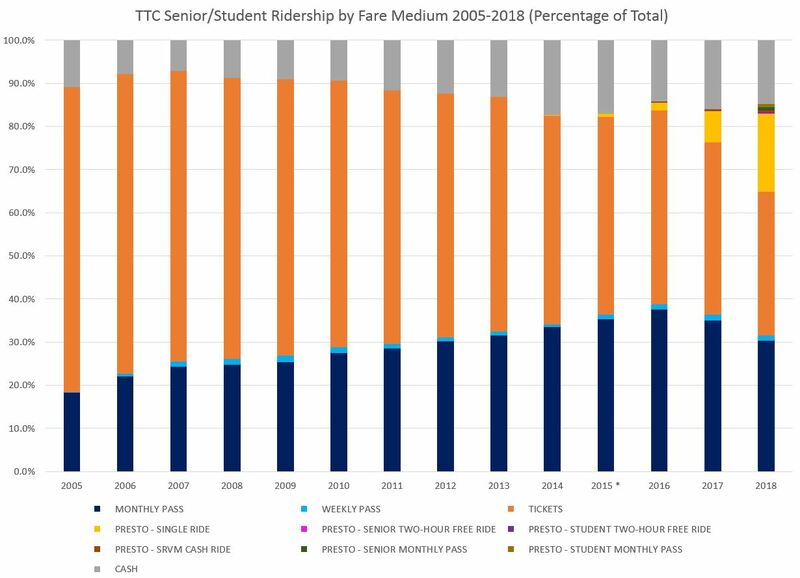 A related issue is that the way the TTC estimates ridership might not accurately reflect conditions in the field. 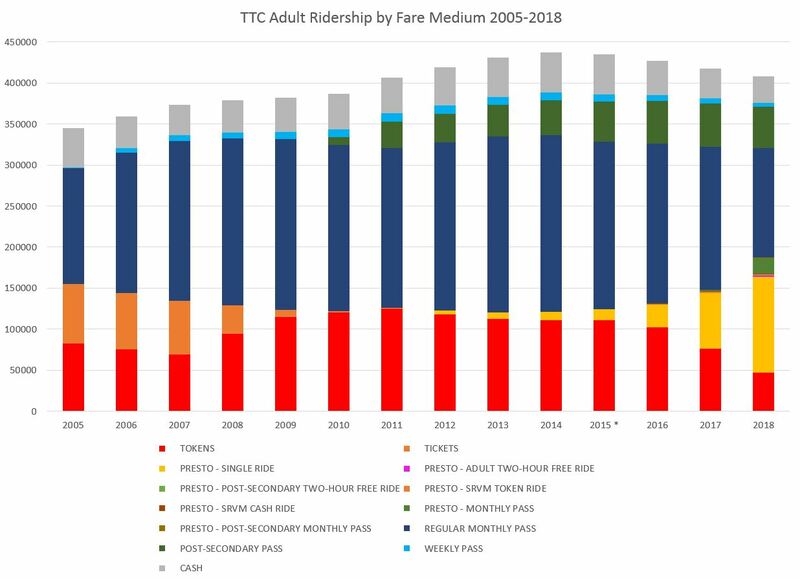 The reported drop in “ridership” in the past few years could lie as much in the methodology of counting multi-trip (pass) usage and shifts from old-style passes to Presto as in a real loss of riders and system demand. 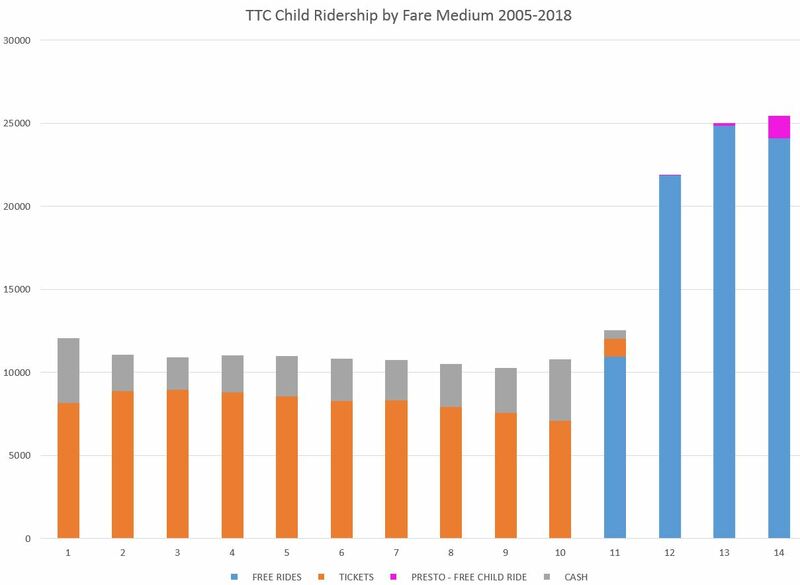 Moreover, a weakening in the rate of growth is clear going back longer than Presto has been available on the TTC, or Proof-of-Payment was in widespread use. Updated February 28, 2019: The TTC has confirmed that schedule and routing for 504 King and 501 Queen will not change at the end of March as originally planned. However, the 29 Dufferin schedule had also been changed to send all buses to the Princes’ Gates loop anticipating streetcar congestion at Dufferin Loop. This schedule change will remain for one schedule period and then be backed out in mid-May. 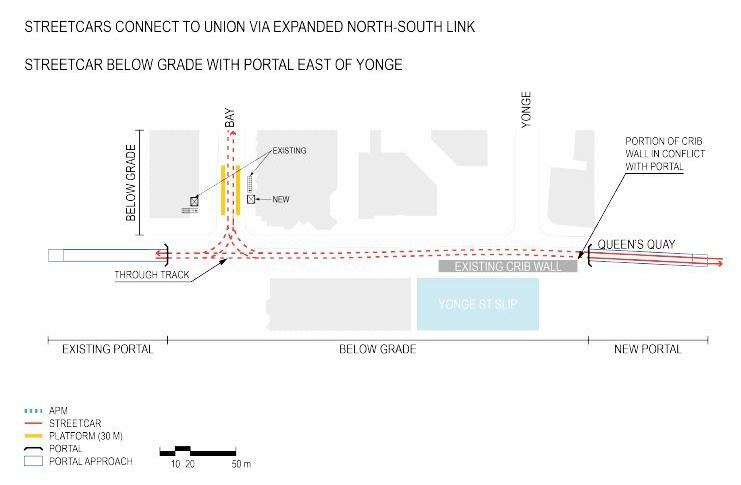 The City of Toronto announced today that the work planned for this summer at the King-Queen-Roncesvalles intersection and westward on The Queensway to Parkside Drive would be deferred to 2020 because of complications with the project. Email from Chief Engineer, Michael D’Andrea. 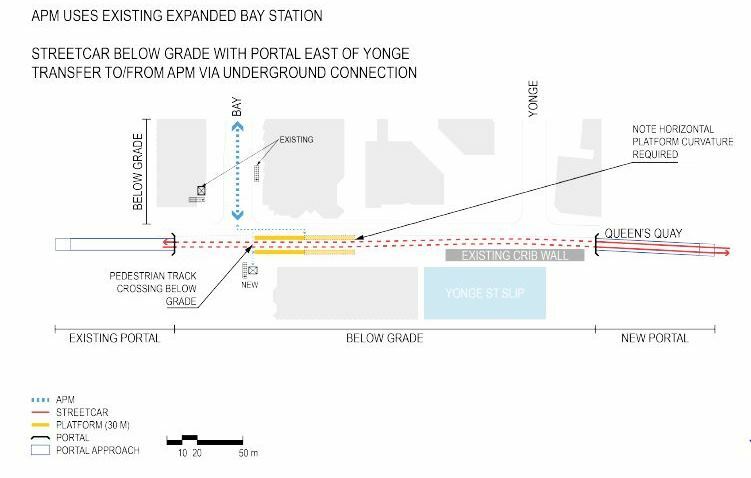 “As you know, in early February, the City issued the tender for the planned project at the intersection at King / The Queensway / Queen / Roncesvalles. This project included: sewer and watermain replacement, replacing the entire TTC overhead and track infrastructure within the intersection and west along The Queensway, Streetscaping, road and intersection works along the Queensway, rehabilitating the bridge over Parkside Drive, removing the right-turn channel at Queensway and King Street and overall intersection / road improvements within the area. Based on feedback received to date from contractors considering the tender, there are areas of construction and design that require additional review and clarity to ensure the construction delivery schedule and budget can be upheld and delivered according to plan. 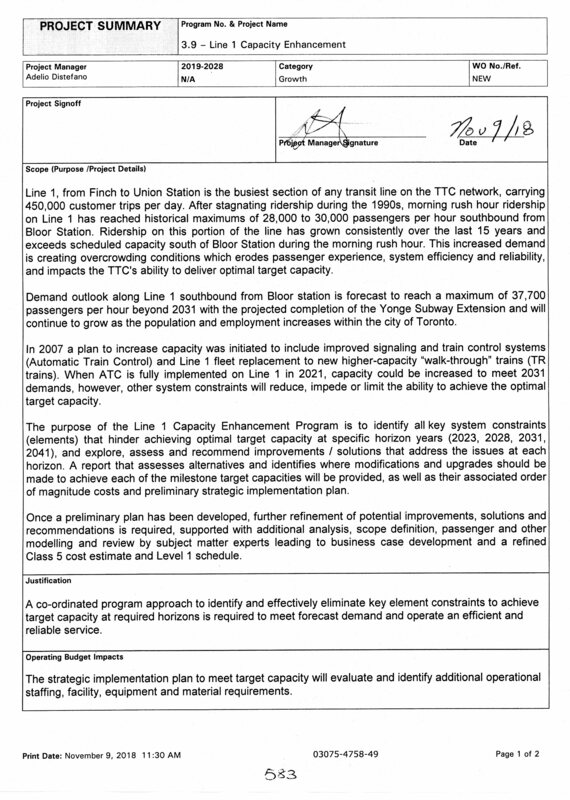 I await clarification from the TTC whether the route changes contemplated to go into effect with the March 30 schedules will or will not take place. They are probably far enough away from finalization of those schedules to avoid having an inappropriate service design for diversions that are not required now. When I hear definitively, I will update this article. 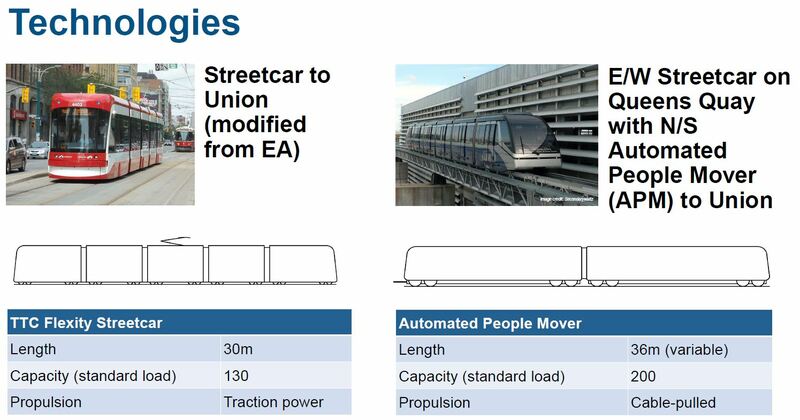 Meanwhile, the expected release of streetcars from the west ends of 501 Queen and 504 King will not occur, and this will prevent the change back to streetcar operation on other routes until more of the new cars are available.